Welcome to The Abso!ute Sound online! We explore music and the reproduction of music in the home. We believe that the sound of music, unamplified, occurring in a real space is a philosophic absolute against which we may judge the performance of devices designed to reproduce music. Our goal is to provide the resources consumers need to judge how a component's sound either honors or departs from the music's truth, and to make sound purchasing decisions that maximize their experience of reproduced sound. Below is our Issue 164, September 2006 table of contents and editorial. 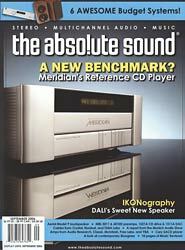 Sue Kraft reviews the new reference model from the company that made the first-ever musical-sounding CD player. Robert Harley comments. Does high end always mean high-priced? We think not, as these six affordable systems will demonstrate. Chris Martens leads the way..
Roy Gregory reports from Germany’s premier audio show. Rare-bird sightings by Jim Hannon — two stereo receivers that focus on the music. A very good turntable just got better — Jim Hannon looks at the latest from Pro-Ject. Affordable excellence from Denmark. Robert E. Greene reports. Neil Gader on winning wires from Crystal Cable, Nordost, and TARA Labs. Chris Martens finds himself listening with his eyes…as well as his ears. The latest offerings from Michael Kelly delivers the goods. Excellent Super Audio sound from Cary, says Robert Harley. Tom Martin ponders why amplifiers are so important. Can multichannel controllers satisfy the music lover the way a good preamp can? Alan Taffel listens to Arcam’s FMJ AV9 and Halcro’s SSP100. Can any solid-state and digital components seduce a pair of grumpy tube ’n’ analog guys? Jon Valin and Wayne Garcia report. Anthony H. Cordesman spins a tale of two amplifiers. David McGee wraps up his two-part journey through the annals of bluegrass by chronicling bluegrass’ modern manifestations and recommending the recorded essentials of its new traditions. Reviews of Golijov’s Ainadamar, Mozart’s La Clemenza di Tito, Foulds’ Dynamic Triptych, Shostakovich’s Symphonies Nos. 5 and 6, a Prokofiev box set, R. Luke DuBois’ Timelapse, Die Walküre on SACD, and two Everest classics on LP. The scoop on the latest from Patricia Barber, Frank Kimbrough, David Hazeltine, and Kidd Jordan, plus box sets from Fats Waller, Miles Davis, and John Coltrane, and a new audiophile-grade Nat “King” Cole LP. Reviews of more than a dozen new albums and reissues, including the latest from Tom Petty, Thom Yorke, Frank Black, Comets on Fire, Sonic Youth, Espers, and Rhymefest as well as box sets on Bob Wills, The Byrds, Gram Parsons, and 50s rockabilly.